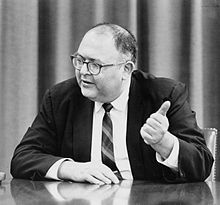 Herman Kahn (February 15, 1922 – July 7, 1983) was an American futurist and nuclear theorist. He was one of the founders of the Hudson Institute and an employee of the RAND corporation. He is most known for his work On Thermonuclear War. 1.1 The Worlds of Herman Kahn: the intuitive science of thermonuclear war. The usual image of war today held by many experts as well as most laymen can be summed up in the phrase "orgiastic spasm of destruction," or, "spasm war." Many believe that if one single button is pressed all the buttons will be pressed, and that some 30 minutes or so later missiles will rain enough destruction to terminate the defender's existence as a nation; subsequently, some minutes or hours later, a similar rain of death and destruction will annihilate the attacking nation. Within perhaps an hour or two the war will be effectively over-both combatants having received death blows-with only one question left; "How bad will the radiation be for the rest of the world?" The Worlds of Herman Kahn: the intuitive science of thermonuclear war. "The Russians aren't dedicated world dominationists. You know, they just sort of want it on account of a sentimental way, you know, but not like 'By God, we got to have it!' It just doesn't make sense for them to really push too hard, you know, but just to push easy." He flips to a drawing of a spindly boy wearing oversized glasses, hugging an ABC primer, and sniffing a daisy. This is the enemy. " The first [mistake] is to assume that he is a sort of cretinoid idiot, who can't see, think, or anything. It might be a fair, if dangerous, assumption that the enemy is at least as stupid as we are." The next picture is a Goliath with four arms, reading a book, lofting a 1000-pound dumbbell, aiming a pistol at a target, painting a picture. The enemy can do everything. "He's a giant, seven feet tall with four arms, each with two biceps. Each arm can, of course, be used simultaneously." He ambles along the platform. "Lots of times people say about systems analysis, why don't you guys do an experiment? What the hell are you sitting here figuring things? Why don't you go out and run an experiment? Well we'd love to run experiments,but there are two difficulties. One, in realistic experiments, people get shot down. That's not the major difficulty. We're willing to do it." The audience laughs. "We are. The real difficulty is we're talking weapons which aren't in existence yet." Actually, even with tested missiles, results of attacks are not really mathematically predictable. The probability of extreme variations in performance, the upper and lower limits, cannot be calculated accurately. But laymen or narrow professionals persist in regarding the matter as a simple problem in engineering and physics. Even if military advantages were not to be had by deliberately limiting attack to counterforce targets, I suspect that most governments would still prefer to observe such limits. Almost nobody wants to go down in history as the first man to kill 100,000 people. The difference between megaton and kiloton is very large, in some ways large than the difference between kiloton and ton. Megaton weapons are comparable to gross forces of nature, such as earthquakes and hurricanes. The final outcome of benevolent, informed, and intelligent decisions may turn out to be disastrous. But choices must be made; dies must be cast. In addition to the obvious dangers, there is another subtle but by no means minor disadvantage to a pure deterrence posture: the threat of mutual suicide is a very uninspiring concept, no matter how logical it may seem. If it happened to involve explicitly the annihilation of all humanity it would also be totally immoral; one doubts if it could long remain an important part of United States policy. Few people differentiate between having 10 million dead, 50 million dead, or 100 million dead. It all seems too horrible. "I don't want to live in your world in which 1 percent of the children are born defective. "My answer was rather brutal, I fear. "It is not my world,"
Even though it is the ultimate in Type I Deterrence, the Doomsday Machine is an unsatisfactory basis for a weapon system. It is most improbable that either the Soviet or U.S.governments would ever authorize procuring such a machine. The project is expensive enough so it would be subject to a searching budgetary and operational scrutiny—a scrutiny which would raise questions it could never survive. The Doomsday Machine is not sufficiently controllable. Even though it maximizes the probability that deterrence will work (including minimizing the probability of accidents or miscalculations), it is totally unsatisfactory. One must still examine the consequences of a failure. In this case a failure kills too many people and kills them too automatically. There is no chance of human intervention, control, and final decision.And even if we give up the computer and make the Doomsday Machine reliably controllable by the decision makers, it is still not controllable enough. Neither NATO nor the United States, and possibly not even the Soviet Union, would be willing to spend billions of dollars to give a few individuals this particular kind of life and death power over the entire world. I have been surprised at the unanimity with which the notion of the unacceptability of a Doomsday Machine is greeted. I used to be wary of discussing the concept for fear that some colonel would get out a General Operating Requirement or Development Planning Objective for the device, but it seems that I need not have worried. Except by some scientists and engineers who have overemphasized the single objective of maximizing the effectiveness of deterrence, the device is universally rejected. It just does not look professional to senior military officers, and it looks even worse to senior civilians. The fact that more than a few scientists and engineers do seem attracted to the idea is disquieting, but as long as the development project is expensive,even these dedicated experts are unlikely to get one under way. However, even those who expect deterrence to work might hesitate at introducing a new weapon system that increased the reliability of deterrence, but at the cost of increasing the possible casualties by a factor of 10, that is, there would then be one or two billion hostages at risk if their expectations fail. Neither the 180 million Americans nor even the half billion people in the NATO alliance should or would be willing to design and procure a security system in which a malfunction or failure would cause the death of one or two billion people. If the choice were made explicit, the United States or NATO would seriously consider "lower quality" systems; i.e.,systems which were less deterring, but whose consequences were less catastrophic if deterrence failed. They would even consider such possibilities as a dangerous degree of partial or complete unilateral disarmament, if there were no other acceptable postures. The West might be willing to procure a military system which, if used in a totally irrational and unrealistic way, could cause such damage, but only if all of the normal or practically conceivable abnormal ways of operating the system would not do anything like the hypothesized damage. On the other hand, we would not let the Soviets cynically blackmail us into accommodation by a threat on their part to build a Doomsday Machine, even though we would not consciously build a strategic system which inevitably forced the Soviets to build a Doomsday Machine in self-defense. here is another form of deterrence which, while not a Doomsday Machine, is still an"ultimate" of a sort. This could be called the Homicide Pact Machine, an attempt to make a failure of Type I Deterrence mean automatic mutual homicide. The adherents to this somewhat more practical device hope to divide the work of deterrence in a natural way: We destroy the enemy and the enemy destroys us, neither of us cheating by buying any effective Counterforce as Insurance for our respective societies. The Homicide Pact Machine is clearly more satisfactory to both humanitarians and neutrals than the Doomsday Machine and both should make the distinction. As far as patriots and nationalists are concerned, I believe that the Homicide Pact system has many of the same drawbacks as the Doomsday Machine, though not in so extreme a form.The major advantage of the Homicide Pact is that one is not in the bizarre situation of being killed with his own equipment; while intellectuals may not so distinguish, the policy makers and practical men prefer being killed by the other side. It is just because this view no longer strikes some people as bizarre that it is so dangerous. I use the words "unauthorized behavior" rather than "accident" because we must guard against many types of events— psychopathic or irrational individuals, mechanical or human failure, sabotage, irresponsible behavior, and so on. In any case, the thought of a catastrophe or holocaust unleashed by accidental (i.e. nonhistorical) causes might be very unsettling to any Marxists who had a passionate belief in a deterministic theory of history. Instead of saying "It is inevitable that we will take over the world in fifty years", this Marxist would have to add, "Always assuming some capitalist fool doesn't press the button." We must not look too dangerous to the enemy. This does not mean that we cannot do anything that threatens him. After all, our mere possession of a Type I Deterrence capability implies that we can harm him if we desire. But it does mean, to the extent that is consistent with our other objectives, we should not make him more insecure than is necessary. We do not want to make him so unhappy and distraught that he will be tempted to end his anxieties by the use of drastic alternatives. We do not wish him to conclude, "better a fearful end than endless fear." We must not appear to be excessively aggressive, irresponsible, trigger-happy, or accident prone, today or in the future. We must not look too dangerous to neutrals. While this is probably less important for us than not looking too dangerous to friends and allies, it is still too important to be ignored. Here again, we must not look excessively destructive. It may be all right to promise the Soviets that if they attack us we will destroy every Soviet citizen in retaliation (though personally I think this far too destructive a proposal), but we should not threaten nonbelligerents with near annihilation because of our quarrel with the Russians. Many of the world's inhabitant perhaps two-thirds of them, do not feel it is their quarrel but feel it is their world. The more destructive we look, the less they like us and our program. To the extent that some in our midst talk and threaten potential world annihilation as a U.S. defense measure, we focus undeserved attention on ourselves as being dangerous and even irresponsible—appearing to be willing to risk uncounted hundreds of millions or billions of bystanders as to our selfish ambitions and desires. Neutrals and bystanders will inevitably suffer heavily in any thermonuclear War. But there is a difference between damage and annihilation. In addition to not looking too dangerous to ourselves, we must not look too dangerous to our allies. This problem has many similarities with the problem of not looking too dangerous to ourselves, with one important addition—our allies must believe that being allied to us actually increases their security. Very few of our allies feel that they could survive a general war—even one fought without the use of Doomsday Machines. Therefore, to the extent that we try to use the threat of a general war to deter the minor provocations that are almost bound to occur anyway, then no matter how credible we try to make this threat, our allies will eventually find the protection unreliable or disadvantageous to them. If credible, the threat is too dangerous to be lived with. If incredible, the lack of credibility itself will make the defense seem unreliable. Therefore, in the long run the West will need "safe-looking" limited war forces to handle minor and moderate provocations. It will most likely be necessary for the U.S. to make a major contribution to such forces and to take the lead in their creation, even though there are cases where the introduction of credible and competent-looking limited war forces will make some of our allies apprehensive—at least in the short run. They will worry because such forces make the possibility of small wars seem more real, but this seems to be another case where one cannot eat his cake and have it. The easiest way in which one can put unintentional strains on the enemy is to have a force which looks "trigger-happy." The one circumstance under which almost all Soviet experts agree the Russians might strike is the one in which they feel they are anticipating a strike by us. It will be difficult for them to read our intentions. They will doubtless err on the side of caution. But it is not clear which side will look cautious, particularly if there is a crisis which creates apprehension. It will add a real element of stability if our posture is such that we do not look as if we have to be "trigger-happy" in order to survive. This is an important reason for not relying solely on quick reaction as a protection and for not having forces so vulnerable that we could lose most of them from a Russian first strike. Under some circumstances our vulnerability to a Russian first strike would both tempt the Russians to initiate a war and at the same time compel them, because they might feel that we would be tempted to pre empt for our own protection. If we are sufficiently vulnerable they might find it impossible to believe that we were willing, in this crisis to rely on their good will, morality; caution, or sense of responsibility as a protection. Equally important to not appearing "trigger-happy" is not to appear prone to either accidents or miscalculations. Who wants to live in the 1960's and 1970's in the same world with a hostile strategic force that might inadvertently start a war? Most people are not even willing to live with a friendly strategic force that may not be reliably controlled. The worst way for a country to start a war is to do it accidentally, without any preparations. That might initiate an all- out "slugging match" in which only the most alert portion of the forces gets off in the early phase. Both sides are thus likely to be clobbered," both because the initial blow was not large enough to be decisive and because the war plans are likely to be inappropriate. To repeat: On all these questions of accident, miscalculation, unauthorized behavior, trigger-happy postures, and excessive destructiveness, we must satisfy ourselves and our allies, the neutrals, and, strangely important, our potential enemies. Since it is almost inevitable that the future will see more discussion of these questions, i will be important for us not only to have made satisfactory preparations, but also to have prepared a satisfactory story. Unless every-body concerned, both laymen and experts, develops a satisfactory image of strategic forces as contributing more to security than insecurity it is most improbable that the required budgets, alliances, and intellectual efforts will have the necessary support. To the extent that people worry about our strategic forces as themselves exacerbating or creating security problems, or confuse symptoms with the disease, we may anticipate a growing rejection of military preparedness as an essential element in the solution to our security problem and a turning to other approaches not as a complement and supplement but as an alternative. In particular, we are likely to suffer from the same movement toward "responsible" budgets pacifism, and unilateral and universal disarmament that swept through England in the 1920's and 1930's. The effect then was that England prematurely disarmed herself to such an extent that she first almost lost her voice in world affairs, and later her independence in a war that was caused as much by English weakness as by anything else. One guy he argued with was my pal Herman Kahn, who could have won any number of Nobel Prizes, except for peace, had he stuck with science. Instead, like Pauling, he tried to save the world, especially his country, from the effects of a nuclear war he was willing to see fought. In college, Herman was determined to show his professors how much brighter he was in their field of expertise, which he was, and which he did to their great annoyance. In the Army, during World War II, he was equally determined to show his brilliance, from the very start at the induction center where the two of us (we were inducted at the same place on the same day) took the Army’s equivalent of an IQ test. Wanting to prove himself, Herman had boned up on every IQ test he could get his hands on. Brimming with confidence he sat next to me, certain he would score 100%, which had never happened before.“Men”, the lieutenant told us, “nobody ever has finished this test, so don’t feel under any pressure to do so. If you give the wrong answers to any of the questions it will count doubly against you, so don’t try and guess. You’ve got 45 minutes to do the best you can. Good luck. Start!” After 20 minutes or so Herman had finished. He rested for a few minutes, checked his answers, and with a few minutes left got up, turned in his paper, and left. A couple of minutes go by and Herman comes rushing back into the room demanding his paper back. “Why do you want it back?”, asked the sergeant. “Because I made an arithmetic mistake on question seventy-four (or whatever number it was) and want to correct it”, said Herman. “Get the hell out of here!”, yelled the sergeant. Herman left. Sure enough he made only one mistake, but that was enough to make him number one in the Army. The author of "On Escalation" is revealed not as a detached analyst, nor even as a cynically bemused observer of human folly, but rather as an enthusiastic choreographer of the dance of death. He relishes the obscene pranks he invents and the cataclysmic phantasies he invokes. This page was last edited on 12 November 2018, at 02:17.